With the potential for the wind to rise over the weekend I opted on a morning session instead of a night session. Conditions were forecast to be perfect and when I woke early in the morning I was a bit surprised to hear the sound of rain on the roof. A quick check of the radar showed a passing storm and although it was quite heavy out west it had really only skirted my chosen locale for my morning adventure. While I waited for the shower to pass I quickly checked the BOM and I was amazed to see that at 3AM the temperature was 26oC and the humidity at 89%. With what looked like a recipe for a great morning of surface action I quickly packed the car and was away as soon as the rain had abated. Arriving at my launch I was quickly geared up, and was a little disappointed to find the system I had chosen for my early morning sojourn was not flowing as strongly as I had hoped. 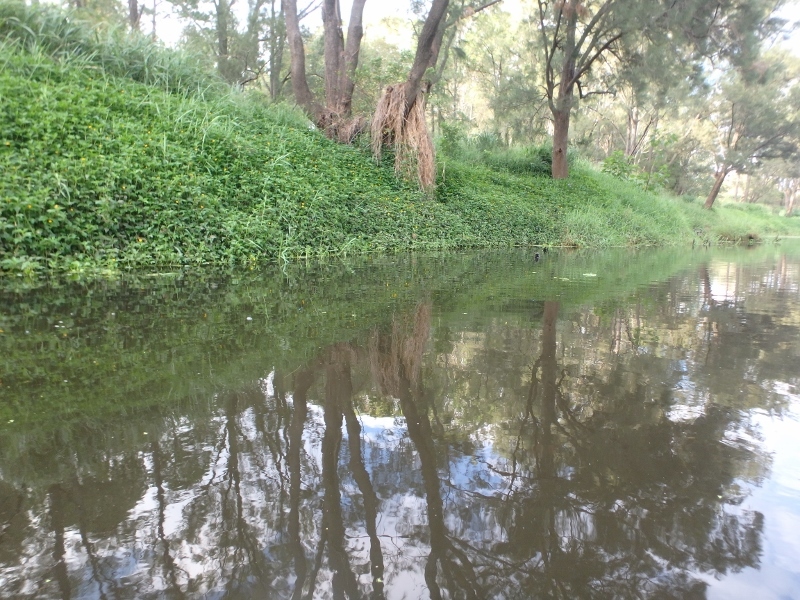 Although there was some flow, the recent heavy rains had clearly not cleared the weed that can take over in the summer when the water flow is slow. As a result the first few casts I made came back all weeded up and I was forced to move to the next pool in a hope that conditions were a little more friendly. Sadly this pool was worse being very exposed to the sunlight and relatively shallow and I almost pulled the pin on my much anticipated morning paddle. 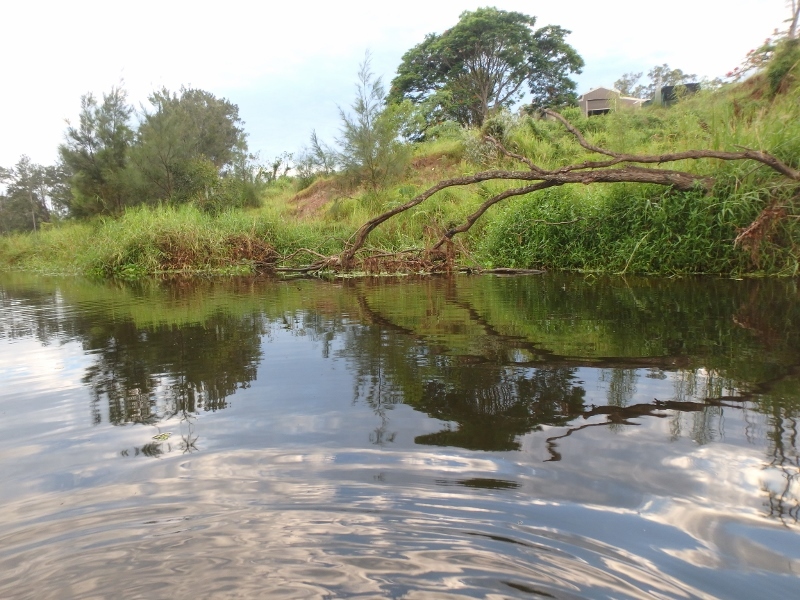 Pulling myself out of a mild despondency continued to the next pool where I hoped the shade of surrounding trees would be enough to reduce the weed growth and give me some clean water to retrieve my lures. After some minor portage I eventually slipped into the next pool and was relieved to find the weed much more sparse than the previous pools. 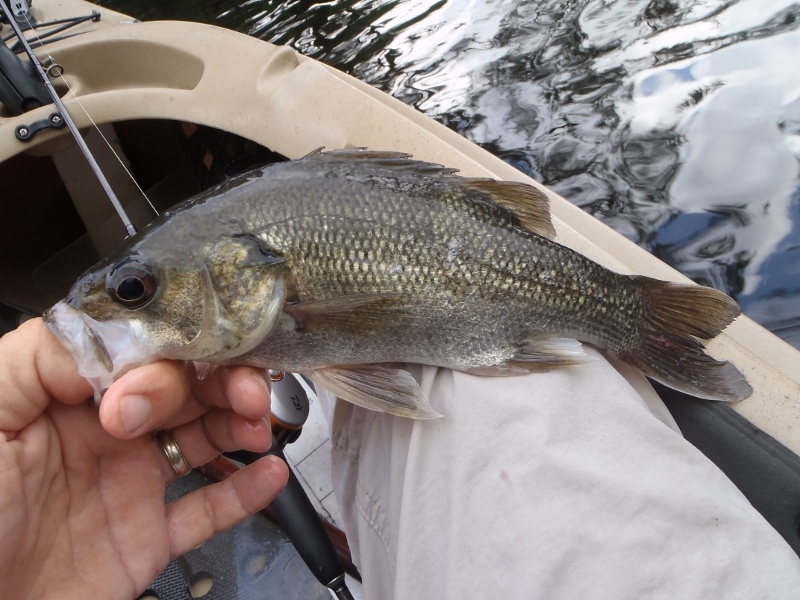 Although not ideal, I was at least able to get some casts in and navigate my SSC through the small flotillas and give the bass a chance to chase the crawling cicada. As soon as I entered the pool I spied a fish creeping amongst the shallows of the right hand bank and a sent a cast in 2 feet to the left of the hunting fish. Sure enough as the SSC landed it darted towards my lure and smashed it. I was on on my very first cast in the pool and eventually netted and 34cmFL bass to start the morning. 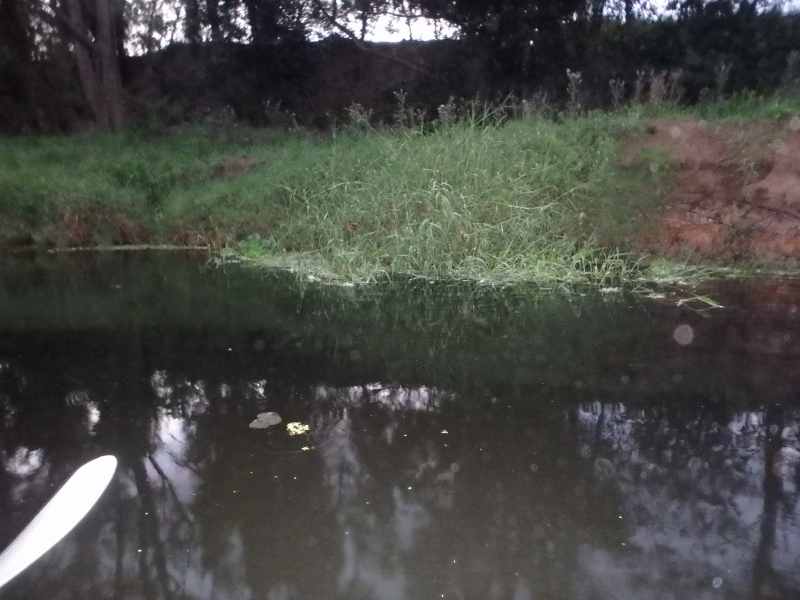 Soon after I missed my second which came out of a small stand of bamboo that had grown horizontally along the waterline. I headed downstream casting at the fringes that were free of the weed that clung to all the exposed structures and forced me to place my casts well out from where I would usually cast. Luckily some of the structures were for what ever reason left unencumbered by weed and it was here that I would have my greatest success for the morning. 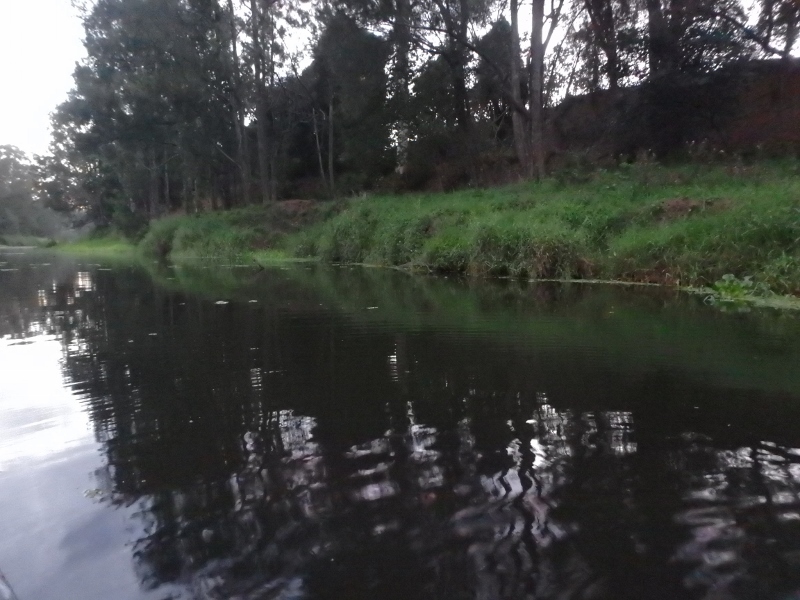 As twilight arrived, and dawn licked at the horizon, I switched to my baitcaster and the ever reliable Sammy 65. After a brief period of inactivity I eventually sent a cast into the corner of a tree that had fallen perpendicular to the bank and it was subsequently plucked off the surface by a 32cmFL bass that was eventually netted. 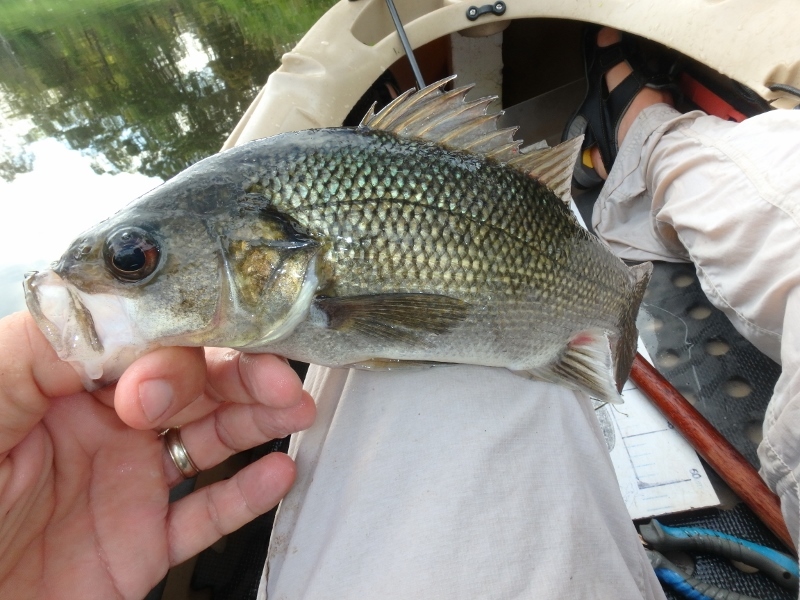 Soon after I cast at an exposed root ball that was the result of an eroded undercut bank and my third bass came yak-side at 30cmFL. 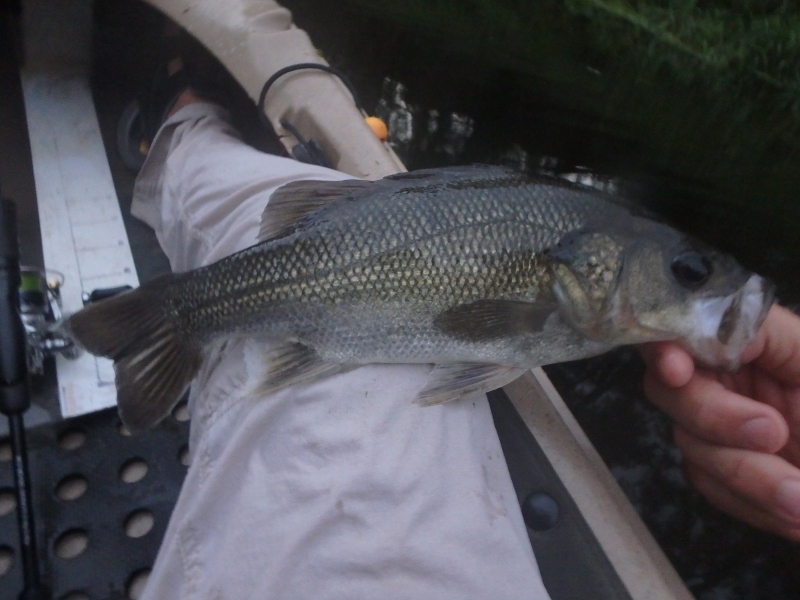 I then managed to miss three bass in a row in a space of 5 minutes before the fishing more or less died. I cast at every accessible structure throughout the rest of the pool and could not raise a fish. I seriously considered packing up and moving to another location but decided to see if I could find any bass to play with in the next pool before I left. The head of the next pool was choked with weed but luckily the wind had banked it up leaving the bottoms of the pool more or less devoid of obstruction. Initially some of my more reliable snags proved very disappointing but eventually a bass had a crack at my lure and missed only to follow it up and smash it on its second attempt. 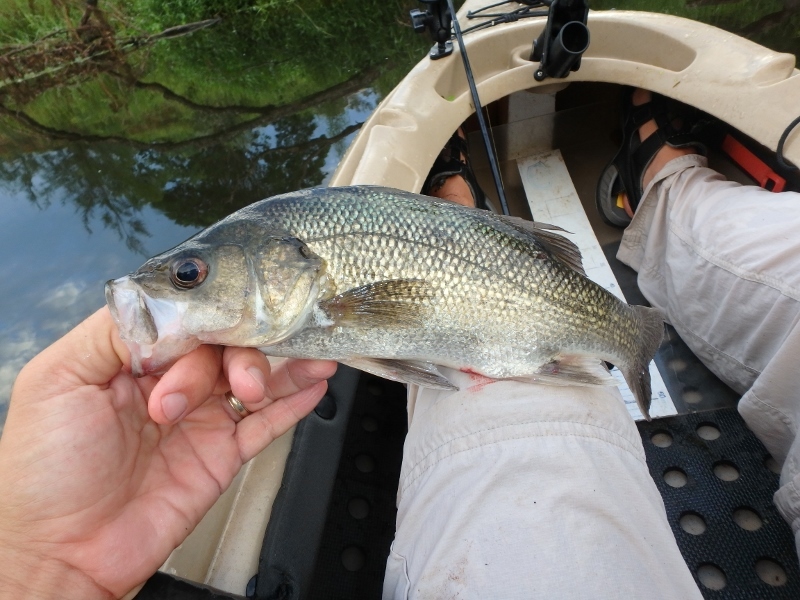 5 minutes later a cast at a grassy fringe attracted another bass that boiled behind the lure initially before following it al the way back to the kayak. Jiggling the SSC just on the surface eventually enticed him to smash the lure but the bass missed and refused to have another crack at my lure. With renewed faith that I would find a few more fish before I had to head home I continued downstream. 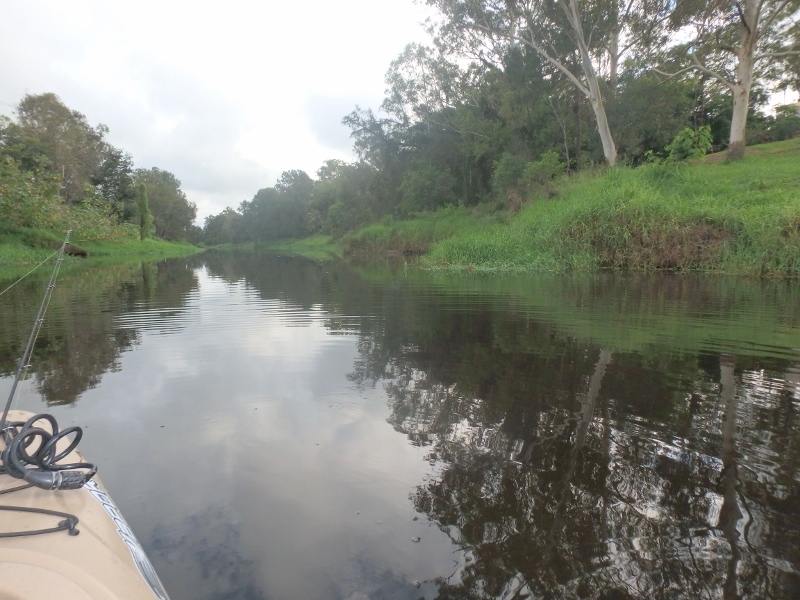 In the following pool, I could not raise a fish and it wasn’t until I reached the much larger pool downstream that I found some more action. 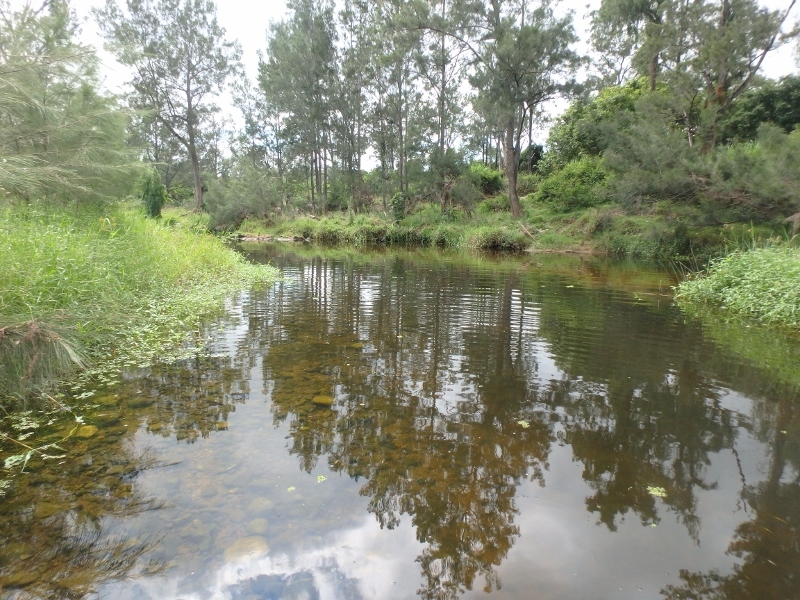 I continued the same pattern casting at the fringes and eventually was smashed by another bass that was hiding beneath a submerged log in the shade of Casuarina tree. 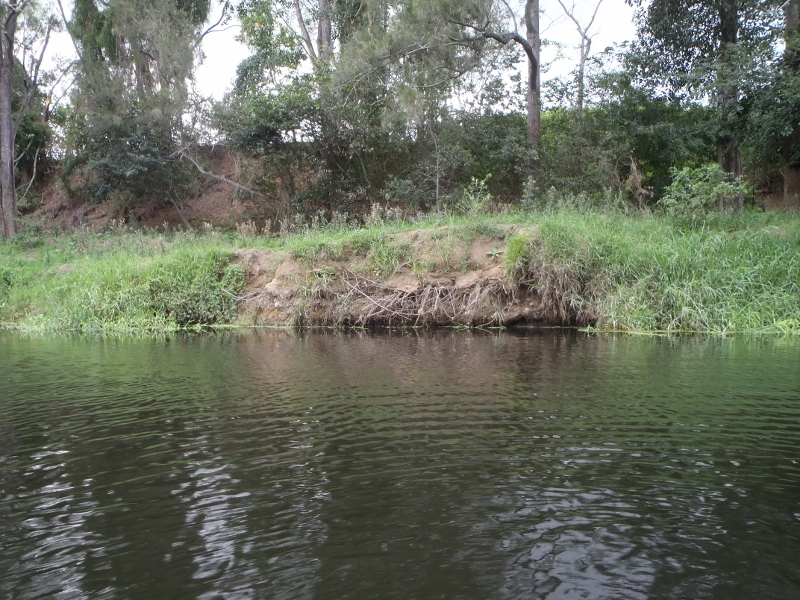 This pool had very little structure and had more or less just grass growing out from the bank for its entire length. As had been the case in previous pools there was a lot of fruitless casting until I arrived at my first bit of structure that in the past almost always held fish. 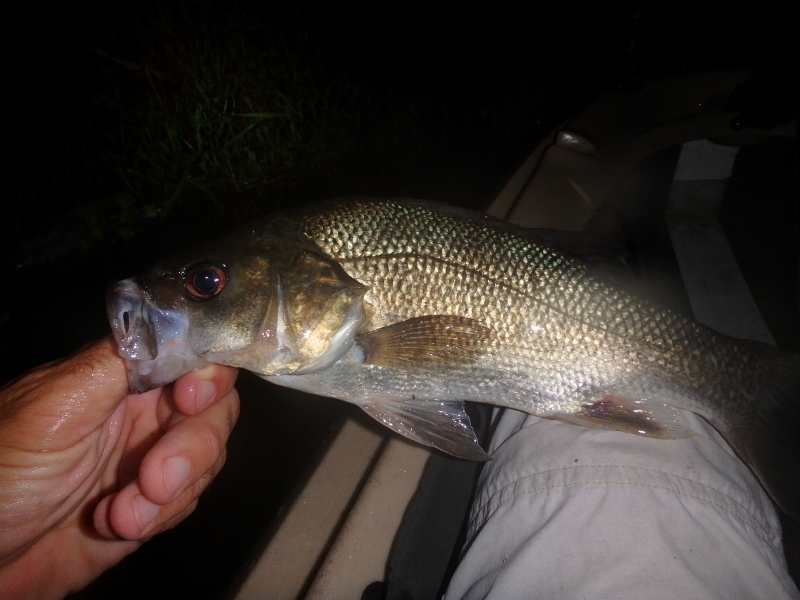 A quick cast at the base of the trunk where it adjoined the grassy bank was rewarded with a solid hit that failed to hook up and then refused to chase the lure. The follow up cast further along the log was then hit by a smaller bass that was again not keen to chase the lure away from its hidey hole. As I passed the log I continued casting at the grassy edge of the river and moments later my Sammy 65 was hit and missed. This time the bass was much more willing to chase the lure and he hit it again and missed before finally smashing the lure and hooking up. At 31cmFL it wasn’t a huge fish but I should have know better that to not use the net and try and handle the bass while I remove the trebles. 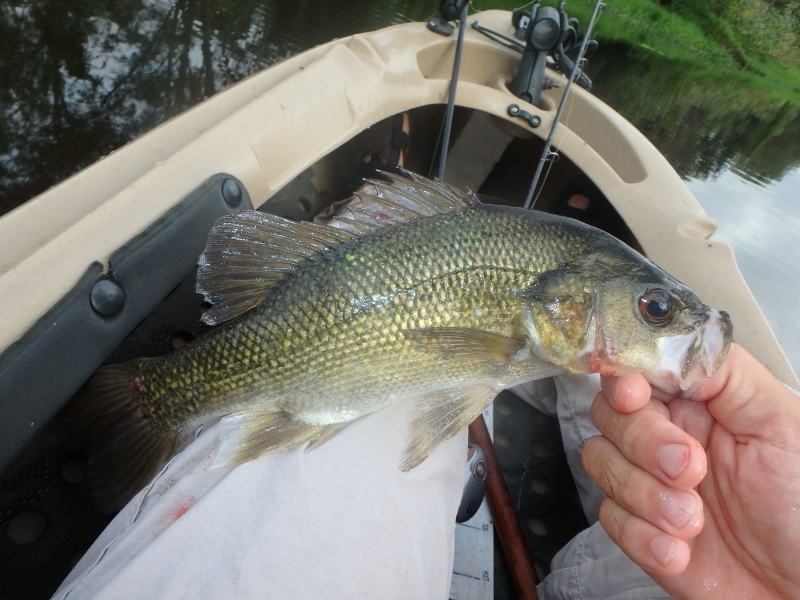 Sure enough just as the finally table pulled free the bass gave a solid shake and embedded treble into the crease between my fingernail and finger. 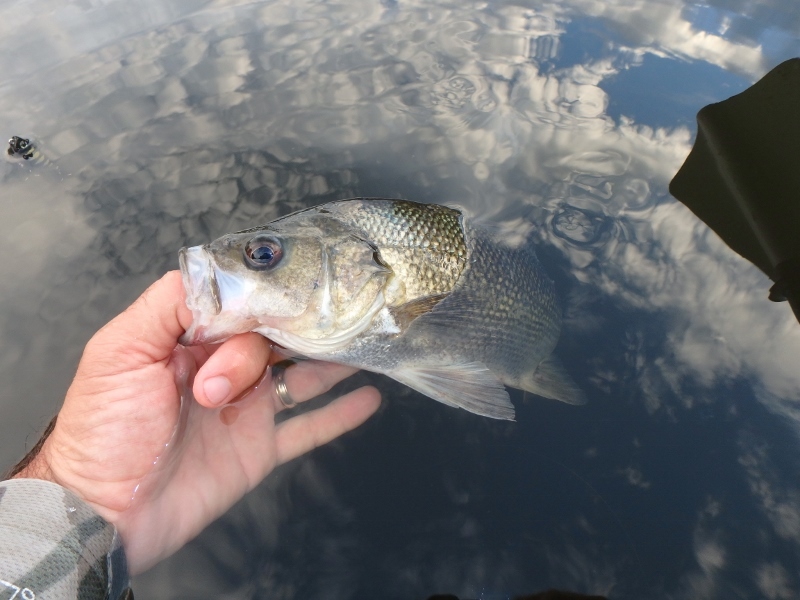 I couldn’t believe I had done it again and was so relieved when the lure pulled free with little tugging. It looked like it was in deep but I think the barb had just been angled fortuitously in the crease and as a result I was able to get it free. It still stung and bled like hell but I was so relieved when it pulled free. Soon after I managed my biggest bass of the morning that followed the lure well away from the grassy bank before exploding below the lure with great gusto. It was a great hit from an average sized bass and I was lucky enough to capture it on video. At 35cmFL it wasn’t huge but it was a great way to spend the morning. I continued downstream but was only rewarded with a single boil and a follow for my efforts. As the sun rose on the sky and the heat and humidity started to take its toll, I decided to head back to the car. On the return journey I switched back to the SSC and re-targeted the structures that had held bass on the downstream journey. Sure enough they were still there and still lack lustre in they encore performance. The first 3 missed the lure again before finally one of them connected and at 34cmFL (blurry photo) gave a great fight for its small size. Much to my surprise I then managed another bass moments later re-casting over old country. 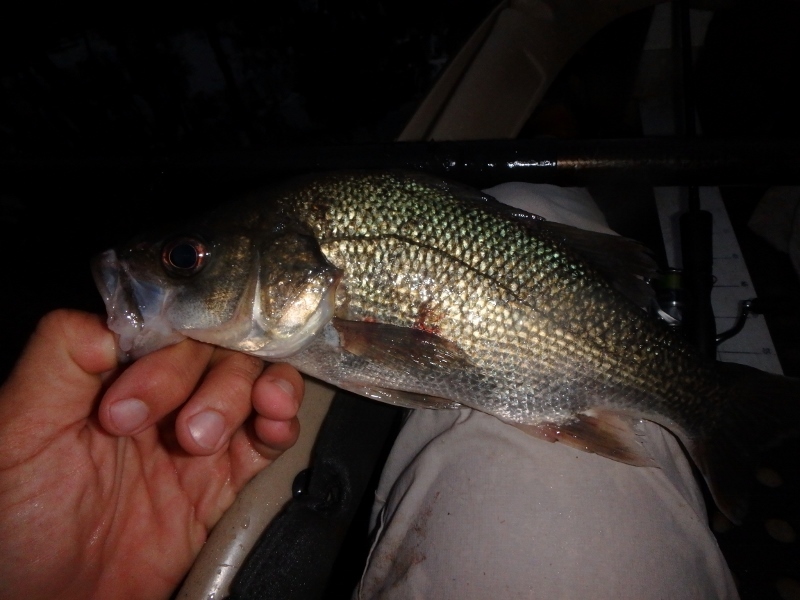 Although my smallest for the morning at 26cmFL, it finalised my tally for the morning at nine bass by 9AM. As you can imagine it was a great way to spend the morning and although the bass were small they were all of the surface which is by far the best way to fish with lures.